Mixed Up Mosaics by Allison Eden Studios is honored to contribute glass mosaic tile art to the iPad For Soldiers charity. NEW YORK - Nov. 13, 2014 - PRLog -- We recently volunteered to take part in a project to pay tribute to our fallen soldiers and those still serving. 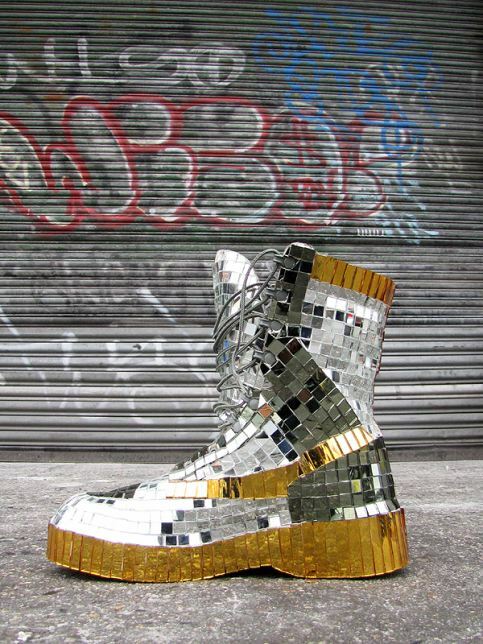 Mixed-Up Mosaics by Allison Eden Studios was given a combat boot worn in Afghanistan to decorate. This boot is part of a display that will tour the country and will ultimately be auctioned off with proceeds going to buy ipads for troops. This boot was worn on average 18 hours a day, sometimes for multiple days at a time, by an American Soldier (man or a woman) in the most dangerous combat regions of Afghanistan. Most infantry soldiers sleep in their boots so they are ready for combat at a moments notice. These boots have traversed dangerous terrain and many times have carried wounded soldiers to safety. During a soldier’s 9 month deployment, it is common for them not to touch foot on any grass only sand and rock. All too often these boots have been a target, bombed, and isolated in an inhospitable environment. We are honored to be part of this project that has so far delivered more than 4000 ipads to our heroes.